modifications - mainly featuring Case and Cooling mods. Fully internal watercooled xbox 360 slim project. Click here! I have been working on the Worlds first Internally Watercooled Xbox 360 Slim. Yes! fully internal, and not in a bulky PC case like all my previous designs. This was a challenge as there was rarely any space inside as well as a risky operation. It's all working fine and it's been tested for over 5 hours at one time. No leaks, no noise, no overheating and really cool. Anyway, check videos and Pics out here! Here is our Project (on the right). Quite old yes maybe about 4 years now however after starting a full time job as an IT technician I have had no time to progress my enthusiasm for this hobby. The Xbox 360 Elite Motherboard was placed in a Thermaltake Soprano case which I picked up from a private seller in Darwen Lancashire. I fixed in a 4 fan speed controller, neon Cathode, Thermaltake Flowmeter etc. The pictures are not that great and I didn't take many to be fair. The initial build used two seperate power supplys, one for the Case and the other for the xbox, until I later revised it and used only the xbox PSU and ran the rest of the fans, pump etc on the same power supply. This youtube video shows a setup I had for a few months. 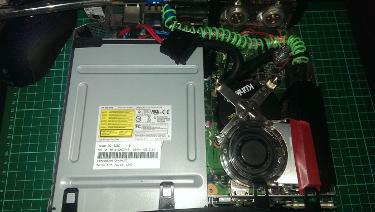 It consisted of a watercooling loop that cooled both the CPU for my PC and the CPU/GPU for the xbox. I had both machines run on one monitor by using a KVM splitter so 2 inputs and 1 output. This worked really well and was quite impressive. It almost felt like the PC and Xbox 360 was merged in one machine totally. As the story goes, the Pump failed (it was an original Thermaltake pump that came with the setup I bought) and so the PC waterblock cracked causing the mainboard on the PC to stop functioning (cry). Yes, it was quite disheartening. But I persisted and split the whole thing up again. So I bought a new waterpump, and made the Soprano Elite 360 (as above). Regarding the PC, I changed the motherboard with one that I had spare which had a blue screen error. It seems that I figured out that some of the CPU pins were bent so I got my tweezers out and very carefully fixed it. This worked fine with my 3.0 ghz dual core CPU. I inserted a Hyper 212 Plus Coolermaster heatsink (phenomenal heat dissipation) and overclocked it to a mild 3.8ghz. I had budget Ram so I couldn't overclock it over 4ghz to make it stable. This Xbox 360 was one made for a friend of mine. A COMPLETE overkill with about 8 fans inside. Yes, it's quite loud. Surprisingly it still lasts today and its flashed so he can play his backups as well. As soon as I get some more time I will be redoing it completely making it more efficient, quieter and give it a much needed clean up! This my friend, was the original Watercooled xbox 360. Everything spawned from here! I went to a local computer shop called Creative Computers (link) and bought a Thermaltake Bigwater 750 after I came back from high school. Extremely excited with the purchase and it meant a lot to me as I had worked for a very long time to buy it. I fitted an AquaTemp monitor which showed the levels of the Water in the reservoir and the temperature of the water itself. This took me 6 months to make in total. I was studying, with GCSEs and simultaneously researching about how hardware works and about the sciences of cooling and efficiency.